Prime Minister Voreqe Baini­marama started his tour of the Western Division yester­day, visiting areas seriously affect­ed by the floods on Sunday morning. He arrived via the Kings Road to monitor the damage caused. From the Rakiraki end, and past Tavua he stopped intermittently to get a closer look of the widespread devastation. However, he chose to head straight for Ba, which reportedly is the most severely affected area in the Western Division. On arrival in Ba, Meli Bavatu, 32, of Nasolo Village was among the many local people who praised Mr Baini­marama for his timely visit. “This natural disaster has touched our lives deeply. We woke up that morning (Sunday) and before we, had breakfast the water rose too, like within 10 minutes,” he said. “We are left with only the clothes we wearing and few more. A teacher who wanted to remain anonymous asked Mr Bainimarama on the current situation on schools and regarding the massive clean-up in the Yalalevu area. Richard Devendra, of Yalalevu, who was doing his share of the clean-up, was surprised by the Prime Min­ister’s visit. He thanked Mr Bainimarama for listening to his story and asked if something could be done to the creek near his home. 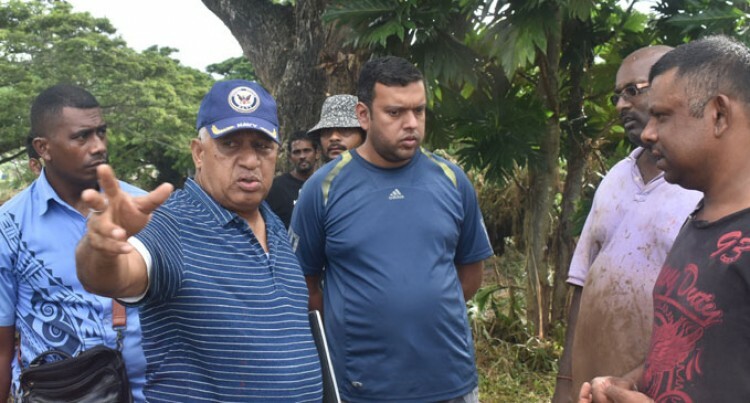 Mr Bainimarama then visited the home of the late Saroj Lata, in Vatu­laulau, where he consoled her hus­band who narrated how he lost his wife in the flood which caught every­one by surprise on Sunday. “Yesterday’s flood happened, and today he visited our area. What a blessing,” Jagdish Chand, the wid­ower, said. Mr Bainimarama commended Mr Chand’s bravery. He then advised the Minister for Lo­cal Government Parveen Bala to ar­range for some water tanks to assist the family on the day of Ms Lata’s funeral and provide other assistance to clean up the area.